IPU: When did you realize for the first time you would run for office to change things in your own community or country? FZN: Ironically I never liked politics and I was critical of it – I believe that attitude indirectly brought me into politics. However, the urge to fight against the victimization of women has been in me since childhood, so the older I grew the louder this voice became. Volunteer work, together with my interest in organizing and mobilizing youth and women to become more aware of their rights and responsibilities, culminated in me being in parliament where the real politics is played. IPU:What benefits do you think your activities in parliament bring to the community you represent? FZN: I joined parliament (at the end of 2010) when Afghanistan was going through a tough time and women’s rights were more challenging than before because of a diminishing interest in Afghanistan from the West due to the economic recession and the gradual withdrawal of Western troops, which have negatively affected all areas of development in Afghanistan, especially its security. This insecurity has meant that I haven’t been able to make an impact to the level that I wanted to bring to my constituency. However, I was still able to raise my voice for women’s rights and youth empowerment in parliament. I believe that doing so encourages others who believe in these values to stand up for their rights and believe in their own ability to bring about positive change in the country. 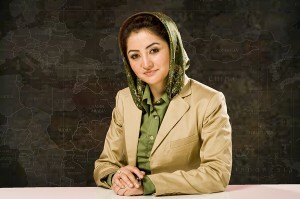 For example, when I raised for the first time in parliament the issue of participation of women in the Afghan Supreme Court, it seemed to be a strict taboo but by continuing to speak out, more people – in particular politicians – have been encouraged to take this topic more seriously and now it is not only my fight but the fight of many parliamentarians and women activists. IPU:Is there an act, a bill or a particular situation that made you feel proud of what you have done as an MP? FZN: Fighting for democracy in a war-affected country, where fundamentalists and extremists are the biggest barriers to development, is very challenging but there are also times when the problems give you energy to continue the fight. When I received the N-PEACE award by UNDP for promoting democracy and its values, it made me realize that no matter how challenging our job as parliamentarians is and however much we might be dissatisfied with the outcomes, there is still recognition of our struggle to achieve our aims. Getting the award has only increased my desire to work for the betterment of my country and people. FZN: As an N-PEACE winner in 2012, I was involved in choosing a candidate for this year’s role model for peace. I nominated Masouda Karokhi, an MP from Herat province, who has been fighting for democracy, justice and women’s rights through more than three decades of war. Her victory in winning the award gave me the privilege of being part of the effort which empowers Afghan women. However, I know I have a long road ahead of me and need to work hard to be able to serve the Afghan nation, especially young people and women who have suffered the most. IPU: How will you be celebrating the International Day of Democracy on 15 September 2013? FZN: By trying to raise public awareness. IPU: Which book, movie, speech or quote would you suggest to people who would like to strengthen their voice?